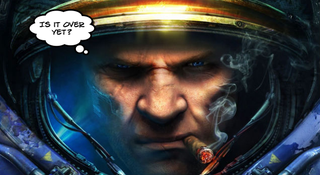 There are many ways to win a StarCraft II match. Countless tactics, schemes, and ways of naming each of your beautiful baby zerglings that you love dearly I mean what no that's crazy nobody does that. This, however, is probably not a strategy you should ever employ. "Hovmand adopted a stall tactic by rushing Ravens and using them to delay the match using their abilities as cost efficient defense. Auto-Turrets combined with Point Defense Drones, which make his other units and the turrets tough to take down, make it nearly impossible for a Zerg player to break through without a lengthy war of attrition. Dai adopted such a strategy, massing Swarm Hosts to slowly break down Hovmand, leading to a tediously long affair." Three hours and 20 minutes later, Dai finally had his pulsating mutant ducks in a row. He was going to overrun Hovmand with Infestors and Infested Terrans. So Hovmand turtled, and he turtled hard. He floated his buildings out of harm's way (if you're new to StarCraft, yes, Terran buildings can float) in order to exploit the fact that, by this point, the map was basically out of resources. Guarded by a veritable murder of Ravens—which can generate free smaller units—Hovmand was once again able to stall while Dai struggled to bust through. He was strapped for cash, and Hovmand obviously didn't have to be anywhere. However, after nearly 50 minutes of bitter, trudging attrition, Hovmand threw in the towel. Or rather, he typed, "IM A TERRORIST" and then threw all his units at Dai's full force. Fin. After four hours in a single game, it was time for the second round. Finally. Mercifully, Hovmand was disqualified—not just from the match, but from the remainder of WCS 2015's first season. The reasons? Well, there was that terrorist quip, but that's the only the tip of the iceberg. Below it, a very slippery slope. As the tediously slow match dragged on, Hovmand tabbed out of the game and checked social media and Twitch chat. He was probably just bored, but people were discussing key elements of Dai's strategy, not to mention his supply count/resources. That information could've easily been used to cheat, which is why Hovmand's in big trouble. He's now on probation for the rest of the year. So that was... a thing. Hopefully Blizzard takes this as a sign they should do some serious balance tweaking to avoid such profoundly snooze-worthy outcomes. A long match is all well and good, but a long, boring match? That's a case of "don't only blame the player; blame the game."